I want to make it clear from the outset that I think Opera is great. I have it installed and use it regularly, but it’s never become my default browser. Opera currently holds 2% of the worldwide desktop market. It’s never moved significantly beyond that figure despite a constant rate of innovations from the company. The market has grown so there are more Opera users, but newer browsers such as Chrome are growing at a considerably faster rate. Marketing is one reason. Opera could never match Google’s advertising budget and the company is based in Norway so it has less impact on the massive US market. The name and logo are not as recognizable as other web brands either. However, this has never hindered Opera in the mobile arena. That is a different market; there are fewer competitors and Nokia has helped by pre-installing the browser on its phones. But given Opera is so well entrenched on mobile devices, it’s a little surprising more people don’t use the desktop version. In my opinion, Opera’s biggest strength is its downfall. It’s highly configurable and offers many options — possibly too many. It takes time and effort to get the best out of the browser. 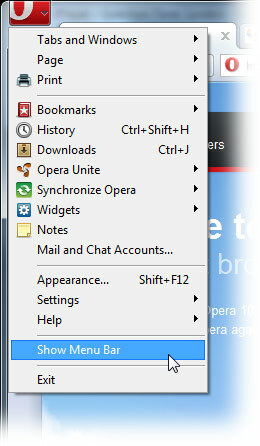 Opera is also configurable in ways which you don’t see in other applications. Perhaps that’s innovative, but it can lead to confusion. I’ve been using the application for many years but I often have difficulty locating the option I need. For example, version 10.5 hides the menu bar but it’s easy to show it (see screenshot). That’s great — but try and find the “Hide Menu Bar” option. It’s not in the “View” menu, Appearance or Preferences dialogs. Even the help doesn’t tell you that the option appears in the “File” menu? That may be a minor esoteric quirk, but it’s an example of how the browser annoys new users. The Opera-specific terminology rarely helps either — how many people understand that the “Personal Bar” is a bookmarks toolbar or that “Opera Link” is a synchronization tool? Opera is usable from day 1, but you need to invest time to learn what features are available, how they work, and how they can be configured. Few people are willing to climb the steep learning curve especially when competing browsers offer an easier and less disorientating experience. That may mean copying other vendor’s naming conventions, but it’ll provide an easier user migration path. Facilities such as Unite, Notes, some toolbars, Dragonfly, mail and chat could all be switched off by default. They could still be provided as installation options or plugins. “Show Menu Bar” should certainly be moved and all options should be logically arranged … why are toolbar settings in both Preferences and Appearances? Advanced options could be hidden, but a single tickbox could bring them all back. Opera deserves a higher market share and the company has reported a 300% increase in downloads following the introduction of the EU browser choice screen (although this could be partly because existing users are downloading the new version). However, they haven’t revealed actual figures and I suspect they remain relatively low compared with Chrome and Firefox. Should Opera change? Should it target a larger audience? How would you improve the browser?